In this part of the data visualization project, we will review charts that help find similarities and differences between various categories of data and discuss their purposes and specifics. But firstly, let’s sort out what a discrete data is. Discrete data can contain only a finite number of values. One of its notable properties is that, unlike continuous data, it can’t be measured, only counted. Examples of discrete data: the number of players in a team, the number of planets in the Solar System. Examples of non-discrete (continuous) data: height, weight, length, income, temperature. The simplest and the most popular type of chart. It displays grouped data using rectangular bars with lengths that are proportional to the values. Bar charts are broadly used in marketing and finance. Use it to compare data points that are spread across categories with each other. A single-series chart in which the values are compared inside one category. This is an example of a clustered (grouped) bar chart. Use it for comparing multiple series inside the same category. A stacked bar chart is composed of multiple bar series stacked horizontally one after the other. This modification of the bar chart makes it easier to track the variation in the individual values and their total value. Use it if you are interested in the proportional contributions either of categories to the total or of values within each category. It’s constructed the same way as a bar chart but with a vertical axis for categories and a horizontal — for their values. It helps track changes in values over time by comparing total column lengths. A stacked column chart is composed of multiple column data series stacked on top of one another. The stacked column chart is designed to compare totals and notice changes at the item level that are likely to have the most impact on changes in totals. Best for part-to-whole comparisons over time or across categories. It helps to get an understanding of the integral picture in a quick glance without a focus on the details. A bullet chart is a modification of a bar chart adapted by modern business needs. It can be displayed both vertical and horizontal. The chart consists of a target marker that represents the target value, an achievement bar that represents the current value of a metric and a comparison range. It was designed by Stephen Few for tracking progress toward a goal and measuring how far you are from the target. Usual meaning: the lighter the background, the better the result. However, in the case of “Expenses”, according to its negative sense, you can reverse the quantitative scale. In this chart, each variable’s axis starts from the center point. Axes are arranged radially around it. The value is presented by an anchor on the axis. This data point is connected with the axis by a line. It’s the process of plotting a polygon. As you may notice, it reminds a spider web; hence the name. 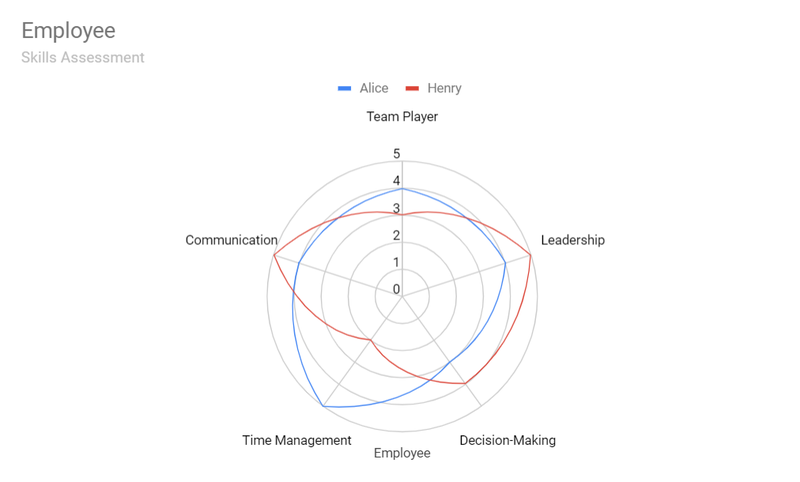 Equivalent names are ‘polar chart’, ‘web chat’, ‘radar chart’, and ‘star plot’. It’s designed for comparing multivariate data that has three or more quantitative variables. Use color coding and labels to distinguish multiple items when comparing them. Don’t be misled by the area of the polygons: it is increased by the squares of values. Thus, one may think that tiny changes are more important than they really are. Take into account that the area and the shape of the polygons may vary significantly depending on the position of axes. We truly hope this overview will help you decide which charts are best suited for your data and get a general idea about how you can compare discrete groups of data graphically. Best Charts to Show Discrete Data was originally published in Hacker Noon on Medium, where people are continuing the conversation by highlighting and responding to this story. Next PostNext Alternative Lenders Firms Are Economic Multipliers. Here’s Why.